This bird has been around for over a century and was once known as the Yorkshire Pheasant, Copper Moss, Golden Pheasant or Old Fashioned Pheasant and is a rare breed now. The Pheasant name comes from the spangled plumage of the female. It gained its present name in 1914 when it was classed as a light breed. It is usually kept for egg production but can be used as a dual purpose bird as the cockerel can produce a good amount of tasty meat and the breed is well suited to a farmyard environment. It originates and has existed in Yorkshire and Lancashire for centuries and is related to the Hamburg and Derbyshire Redcap. The feathers are spangled with a crescent shaped spot at the end of each feather and they have a red rose comb, smooth face, white earlobes and red wattles. The legs are slate grey and featherless, as are the feet, and it is a graceful looking bird. 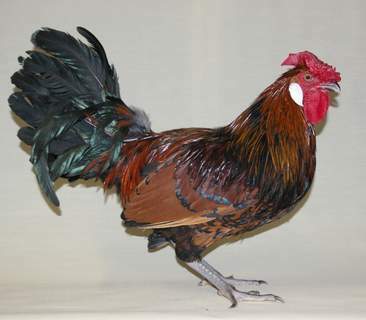 There is a quater size bantam version but this is very rarely seen these days. 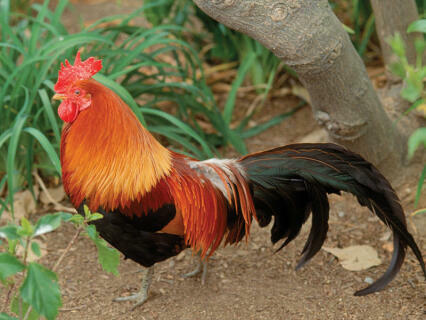 They are fairly wild and active birds with a habit of roosting in trees and they are best suited to free ranging. They are extremely hardy and thrive in the cold winters in the North of England. They lay a good number of large white or cream eggs but the pullets don’t usually come into lay until they are around 7 months of age. They do tend to go broody and make very good mothers. Chicks are vigorous and strong but take a long time to mature. Hens weigh approximately 5-6lb while the cockerels are 6-7lb. There are two varieties available; the gold and silver. The gold has rich bay coloured feathers with darker markings while the Silver has white feathering with beetle green/black markings. I had 2 hens and a cockerel, the hens were very friendly and would roll over for a tummy rub. The cockerel was a fantastic character, highly protective of his hens, I still have the scars to prove it when I put my hand through the pop hole. He was fine with me in the garden though but wouldn't tolerate anyone else and would chase at surprising speed and with amazing stamina anyone else who entered his domain. He would attack without fear or mercy and even gave one of the neighbours dogs that had strayed into the garden a good doing over and it was not a small dog (it never ventured back) They would eat anything, were excellent mouse catchers and would play mouse rugby, shrieking in a frenzy of tackles and sprints until one of them would swallow the victim. The only problem with the hens was that they had some sort of neurological disorder that made them have jelly legs, it didn't progress and I was told that it was a result of inbreeding due to low stock levels.